China's first Waterfront Studios, the only one of Guangzhou Avenue, Guangzhou's first European winery wine clubs, as a marina and public recreation areas in South China's only three T-shaped bridge piers ... ... Pacific century warehouse (Taigucang) successfully turned people upset. The end of 2003, when he was Mayor of Guangzhou Zhang warehouse to Pacific research, in recognition of its historical and cultural position at the same time, proposed a Pacific position in the future "to retain the original appearance of the development" scenario. 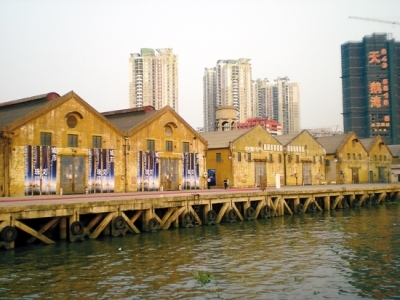 Just a few years, the Pacific from the former warehouse dock loading and unloading dock successfully transformed into today's modern service industry base, Guangzhou, "three old" transformation, the development of modern service industry as a model.